A custom scrollbar library that only enhances scrolling instead of reimplementing it with custom scroll behavior. Vuebar uses native scroll events to detect and synchronize scrollbar position. This makes possible to hack into the native events of scrolling element without hassle. See it in production on GGather.com. Works in the browser and also build (webpack, etc.) environments. Below is some markup without any options, there are some customization options & styling available here. 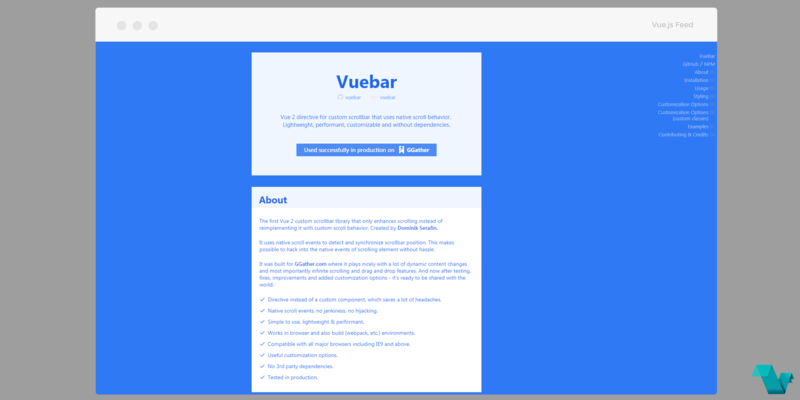 If you would like to explore more about VueBar, head to the project's repository on GitHub, where you will also find the source code. Created and submitted by @SerafinDominik.